...to talk about "best practices"! Came across this article on the BBC website today. Interesting to read the interpretation that power of "social learning" in the chimp community is so strong that the chimps stopped innovating and adapting, and complied with "what they had learned" - however inappropriate and suboptimal that approach was. 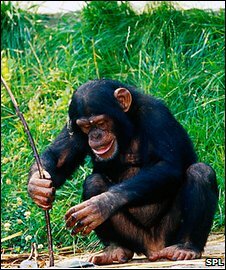 Now we can all smile at the chimps with their sticks and grapes - but I can see some parallels here with how culture develops in organisations, and what we learned once about something which works, left unchallenged becomes a barrier to future adaptation. Which in turn, is why I have such a struggle with the term "best practice". Reminds me of the old apes, the banana and the water spray story.